Kevin Harvick clawed back into title contention with an almost picture-perfect performance for 3-1/2 hours, winning the Kansas 400 on a treacherous track and a wild and wacky Sunday afternoon at Kansas Speedway when most rivals had trouble staying out of the wall and off each other. Matt Kenseth, 11th in a struggle, and Jimmie Johnson, sixth, with a late-race bobble, came out of Round Four of the 10-race NASCAR playoffs virtually tied for the Sprint Cup points lead, Kenseth three points up heading this week to Charlotte Motor Speedway. The day's big loser was Kyle Busch, who had a miserable weekend here and took a sizeable hit in the playoffs. He got caught up in several incidents, the last one taking him behind the wall, and left him griping about rivals taking so many shots at him. At 35 points behind Kenseth, Busch isn't out of the chase but his chances are a lot longer now. Tempers were high all weekend, because of the very fast track and very tricky tire situation. Drivers complained all day about no grip, especially when in traffic. "It was a struggle all day," Kenseth said. "I haven't had to drive a car like that in a long time. It was just incredibly treacherous." With 15 cautions for 71 of the 267 laps, it was a remarkably rough and ragged afternoon. And drivers didn't cut each other any slack, perhaps oddly, given 200-plus mph speeds into the corners. "Back there in traffic it was like guys were hacking with machetes," Kurt Busch said. "Even the first lap there was shrapnel everywhere." The race had barely started when the first yellow came out, for Danica Patrick. The crash-fest continued, pushing teams into differing pit strategies, and the race itself didn't really settle down. The only constant was Harvick and his car's speed. He led half the race. Brad Keselowski was the only other man who had a decent handle on his car and the track, but he ran out of gas at his final pit stop, dooming his bid here. Keselowski, last year's champ but not making this year's playoffs, finished 17th. The Busch brothers were big stories all weekend. 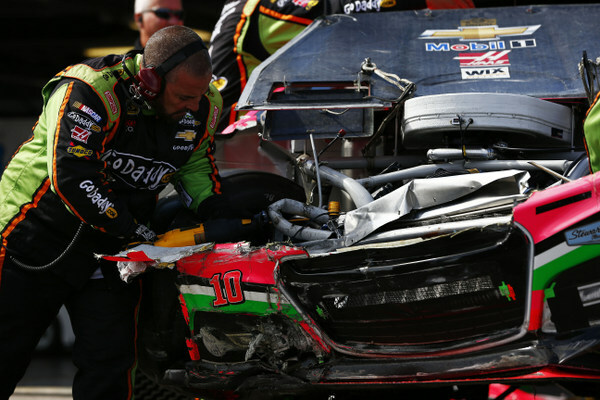 They crashed in Saturday practice and were forced to race backups, from the rear of the field. Kurt Busch made it all work, though he had to work over Jeff Gordon at the end....which led to a brief discussion between those two on pit road afterwards. Kurt is leaving the Barney Visser/Todd Berrier team at the end of the season, just a month away. And much has been made of Busch helping Visser, a single-car team owner in a sport dominated by mega-teams, make the playoffs. This was Busch's first top-5 at this place, which is, geographically speaking for the Colorado-based team, Kurt's home track. "This might be a David versus Goliath story....but I really want to win for these guys," Kurt said. He's 47 points down -- in a sport where the max a driver can score is 48. So his title bid appears over. Still he has continued his remarkable career comeback this season. Finishing second would have been an accomplishment no matter the circumstances. But Goodyear's new tire combination here, never raced before, threw a wrench into everyone's game. "I think we swung and we missed on the tire combination for today," Kurt Busch said of the Goodyear decision. He himself was one of the men in the July tire test here. But Sunday's weather -- 43 degrees overnight, after a 93-degree high during Friday practice -- left everyone scrambling for a fourth straight day at this difficult track. Thursday practice, Friday practice and Saturday practice all seemed to go for naught. Except for Harvick and Keselowski. Harvick's consistency was striking. He is leaving the Richard Childress camp at the end of the season and moving to Tony Stewart's team. But he, like Kurt Busch, isn't playing lame duck in these waning days. Harvick has never won a championship since Childress brought him up to Cup upon Dale Earnhardt's death in 2001. And that has frustrated him. "To have a car fast enough for me to win the pole says a lot about the speed we had," Harvick said. His last pole was back in 2006. 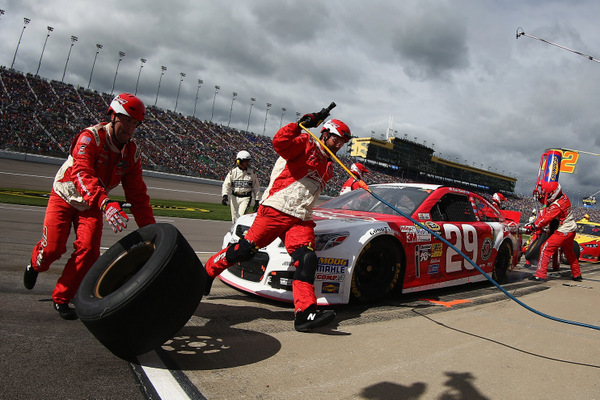 But it was a cool call by crew chief Gil Martin with about 100 miles to go, after Harvick had slipped back to 16th, during a series of gamey pit stop strategies. "They kept me calmed down, because it was tough in traffic and track position was so important, and I knew if we could get back up front we'd be okay," Harvick said. Johnson managed to recover. But in the final moments he had a big scare, while running fifth: "With two to go it started shaking real bad down the backstretch. But the last lap it came back, and I was able to hold on." He only lost one spot with that. "All in all just a crazy day, weird restarts, lots of chaos," Johnson said. Jeff Gordon battled vigorously with Kurt Busch for second down the stretch, and the two seriously aggravated each other. 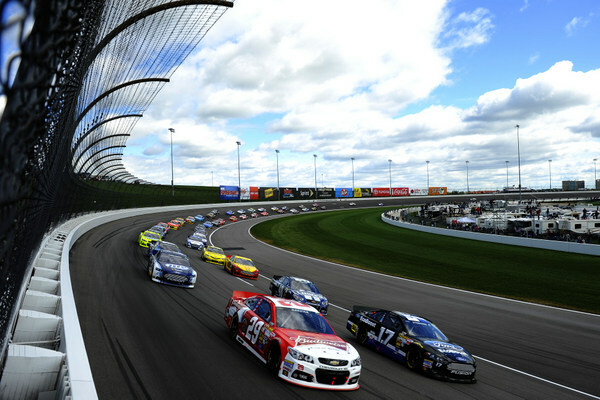 "Restarts were just treacherous today...and you have to give an inch to get an inch," Busch said. "There was a restart where he was on our outside through one and two, and he just didn't quite give us an inch. He dumped so much air under the rear of our car where I was on banana peels sliding up on the exit of two. And he thought I was trying to pinch him. "So I returned the favor by putting my nose close to his rear bumper and took away that inch instead of giving an inch and got back by him. "It was a battle. Could it have been cleaner? Yeah. But at the same time the track is so treacherous on restarts that it's hard to pass. 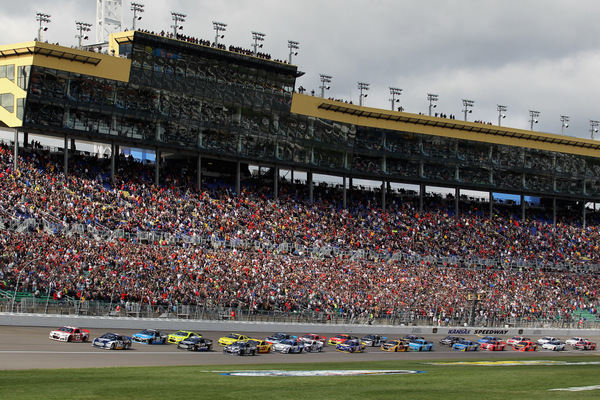 Everybody was getting aggressive on restarts." Gordon's viewpoint: "It was really just hard racing. I was fine with all of it up, until he drove into my door on the back straight. There was just no reason for that. "And these cars are so aerodynamically sensitive, every little thing makes a difference. When he did that, all of a sudden my car started pushing really, really bad. "Luckily we got to fix it. "I just wanted to let him know my side, and hear his side. I wasn't trying to get in a fight or anything. We agreed to disagree. "Kurt and I get along fine. I just wanted him to know to have a better reason than that to run into the side of my car. 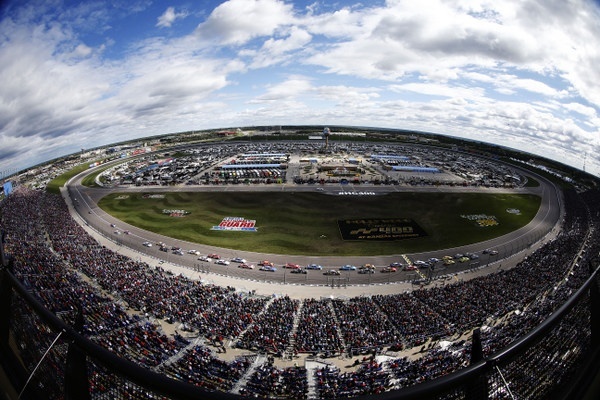 "It's not a NASCAR race if you're not having a discussion with another driver after the race." In a classy move, Kurt Busch came up to Gordon well after the race to attempt again to defuse the situation. Submitted by RJ on Sun 10/06/2013 - 17:01. What is holding up the release of the 2014 schedules ? Sprint Cup is usually always published by Labor Day or Sept. 15th latest. I can see the Nationwide & Truck schedules having some issues. 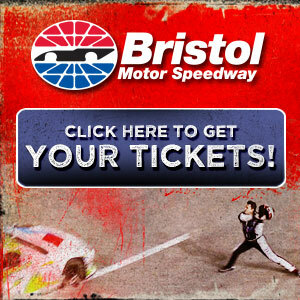 Is something up with 2014 Cup schedule ?